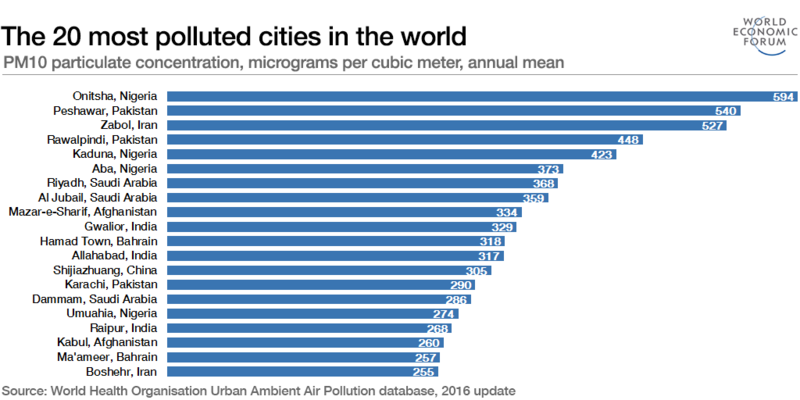 Which are the world’s most polluted cities? Air pollution has risen by 8% globally in the past five years, but China is addressing its air pollution problem. Most large cities in the developing world are breaching global air pollution guidelines, according to new data from the World Health Organization. Air pollution has risen by 8% globally in the past five years, with the WHO estimating that it causes 3 million premature deaths a year, making it one of the greatest environmental risks to human health. The latest urban air quality data, collected between 2011 and 2015, reveals that 98% of cities with over 100,000 inhabitants in low- and middle-income countries do not meet WHO air quality guidelines. So which cities have the worst air quality? Of the 3,000 cities in the WHO’s air quality database, the most polluted at the time of measurement was Onitsha, a fast-growing city in Nigeria, which recorded roughly 30 times more than the WHO’s recommended levels of PM10 particles. Peshawar in Pakistan was in second place, followed by Zabol in Iran. The Eastern Mediterranean (covering the Middle East and parts of North Africa) and South East Asia were the regions that performed worst overall in the database – with urban air pollution rising 5% in more than two-thirds of cities. Annual mean levels of air pollution in cities in these regions often exceeded five to 10 times WHO limits. Among mega-cities (urban areas with over 14 million inhabitants) Delhi and Cairo had the highest levels of urban air pollution. The report urges policy-makers at international, national and city level to promote cleaner transport, more efficient energy production and waste management. Despite the bad news, the data also revealed that more than half of the monitored cities in high-income countries and more than one-third in low and middle-income countries reduced their air pollution levels by more than 5% in five years. Commenting on the data, Dr Maria Neira, Director of the WHO’s Department of Public Health, Environmental and Social Determinants of Health, said: “Urban air pollution continues to rise at an alarming rate, wreaking havoc on human health. Which country has the worst air pollution?